The PEUGEOT SPORT range is reinforced in 2018 with the arrival of the new PEUGEOT 308TCR. This car is a significant evolution of the 308 Racing Cup, which itself derives from the PEUGEOT 308 GTi by PEUGEOT SPORT. The new car is destined for the exciting TCR category, which is now crowned by the newly-launched WTCR series. On top of the PEUGEOT 208 Racing Cup and PEUGEOT 308 Racing Cup – which will remain active – PEUGEOT SPORT is deploying its know-how and reinforcing its range of circuit racing cars with the new PEUGEOT 308TCR. The chassis, engine, gearbox and aerodynamics of this sporting version of the PEUGEOT 308 are specific to the TCR and international touring car competitions such as the VLN (in Germany), CER (in Spain) CITE (in Italy), BGDC (in Belgium) and other endurance racing championships like the 24H Series. Orders will open on January 3, 2018, with the first cars delivered in April 2018. A catalogue of technical options is available. The PEUGEOT 308TCR will be on display at the PEUGEOT stand during the Geneva Motor Show in Switzerland, from March 8-18. The PEUGEOT 308TCR is born out of the PEUGEOT 308 Racing Cup, the showcase circuit racing model when it comes to customer competition at PEUGEOT SPORT since 2016. However, the two cars are distinct with different philosophies; the PEUGEOT 308TCR deliberately targeting absolute performance. The THP engine benefits from a robust base that has already demonstrated its capability to withstand significant amounts of power per litre. Plenty of work has been done on the induction, the exhaust, and turbocharging – allowing the turbocharged 4-cylinder block to develop 350 horsepower and 420 Nm of torque from 3000rpm, while maintaining the potential to cover 5000 kilometres: nearly double the amount needed for an entire WTCR season! In terms of transmission, the PEUGEOT 308TCR benefits from a specifically-designed gearbox (which is strengthened compared to the PEUGEOT 308 Racing Cup): a 6-speed sequential unit controlled by steering wheel-mounted paddles. Thanks to a significant widening of the track and a specific suspension layout, as well as adjustable anti-roll bars at the front and back, not to mention ball joint suspension all-round, the PEUGEOT 308TCR benefits from a strong turn-in to corners and a perfectly compliant rear end. The numerous set-up options available for the car (ride height, track, and camber – both front and rear) allows the chassis set-up to be adjusted for all circuits, to suit every driver. When it comes to braking, the PEUGEOT 308TCR is also well-equipped, making use of Ø 378x34 mm ventilated disks at the front with 6-piston callipers, and Ø 270x12 mm disks at the back with 2-piston callipers. A new pedal box – completely designed with racing in mind! – finishes everything off, giving the driver all the tools needed to master the car perfectly. The bodywork of the new PEUGEOT 308TCR has been jointly created by PEUGEOT SPORT and the designers from the ‘CENTRE DE STYLE PEUGEOT’, achieving optimal aerodynamics within an athletic silhouette, thanks especially to plenty of development work using CFD, and an impressive design. The front bodywork – which has been particularly carefully designed – allows a perfect flow of air towards the radiator and the intercooler, essential for performance and reliability, while the splitter generates maximum possible downforce to provide directional stability. At the back, the rear bodywork is characterised by a large diffuser, to produce more downforce. The aesthetics of the car are completed by specific 18-inch wheel rims, equipped with tyres in 27-65/18 size. 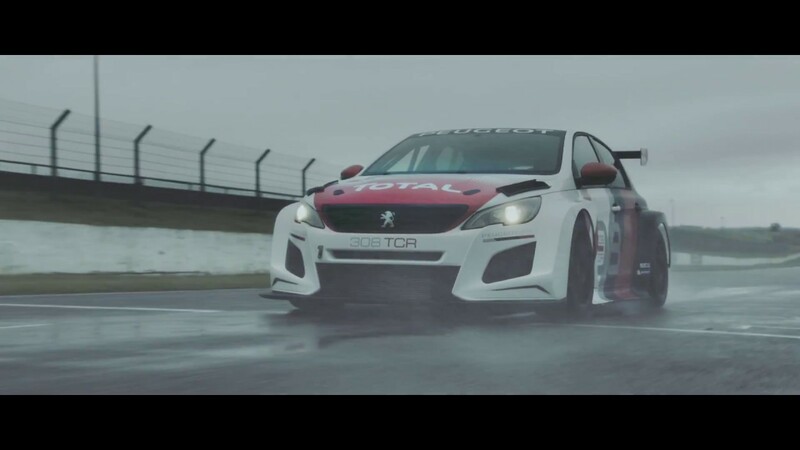 Its technical characteristics mean that the PEUGEOT 308TCR is perfectly suited to take on its strongest rivals and delight all drivers looking for the best performance possible, while running costs will please teams.